Let’s update the procedures for building a website. Before considering the site architecture or web graphics, schedule content before anything else. We all know by now that having a website is not enough, and one thing many website managers have in common is that they forget that blog and content writers should be required to wear many hats. It’s no longer enough to send an email with a document attached. First, let’s tell it like it is – your content is more effective when it’s “off page.” Your customers come to your website because they need answers to a problem or want to contact someone to help them with an issue. They don’t want to read boasts about your company. Therefore, consider content on your website the window dressing that gets in the way of what they need. Unless your website is updated on an hourly basis or you are offering some other real-time service or product through it, users are ignoring your news feeds altogether. Instead of putting content above the fold, put contact information above the fold and relevant troubleshooting solutions. Most customers want answers from your website, not thought leadership. When you do put content on it, make sure it’s focused on solutions and value pertaining to existing services. This strategy is often more successful for funneling customers because it has context on your products. The argument for posting to multiple venues is further supported by the ease with which writers can post to these outlets already familiar to them. The price of content writing reflects the ease. Website managers should put less emphasis on posting to their own websites and more emphasis on getting writers to contribute to those digital venues outside the company, especially LinkedIn and Facebook. A hired writer needs no special training posting to Facebook where a custom Joomla or complicated Word Press integration implies higher fees for the contributors. Somewhere along the way marketers decided sending emails to customers and subscribers was a waste of time. In reality, news digests that aggregate information is making a comeback. 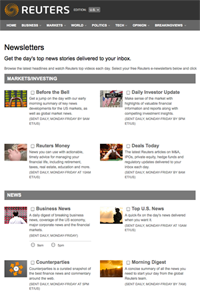 Check out Reuters.com‘s free news aggregation service that lets subscribers specify what headlines show up in their inbox. By hiring writers to create newsletters, you can pluck stories from them while maintaining a fresh and periodic media outlet that your customers will appreciate. For far too long, website managers have considered a static word count the guidepost for paying writers. Because a picture is worth a thousand words and videos much more, the price of content writing should be based on time and quality, not quantity. Consider using oDesk or Elance online outsourcing venues which offer hourly tracking software to monitor contractors’ time on projects. Where five years ago it was enough to have a website, today’s successful marketing professionals know the elements to successful digital marketing derive from the division of off page referencing, including sourcing information from emails they receive on a daily, weekly or monthly basis. To schedule content before anything else means hiring writers based on these aspects.